UPDATE: Meadows added a limited slope opening. The Buttercup lift will be turning from 3-7pm and will include a park setup with five rails. 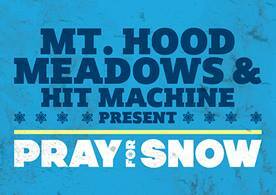 Lift tickets are just $10 and for those over 21 that will get you in to the Pray For Snow party as well. Opening soon or opening now? Either way we need more snow. Get to Mt. Hood Meadows and make it happen this Saturday, November 21 from 11 in the morning 'til 11 at night. That's right, on the mountain. The place where we want the snow. Earlier in the day, until 5pm will be all-ages as various food, drink and retail establishments will offer discounts and previews of the coming year. Then comes the sneak preview dinner with Meadows' new executive chef, Matt Stine, and owner, Matthew Drake. Finally, the Pray For Snow Dance Party with music by Hit Machine also featuring fashion shows, raffles and a slide show from staff photographer Grant Myrdall. Doors at 7:30, 21+ Get up there and party down! Envision everything you see covered in snow. Except the band, that would mean a faulty roof.